Nonprofits are able to serve their communities because of every single donor that supports their mission through volunteering, advocacy, and gifts of all shapes and sizes. Each supporter deserves appreciation for what they bring to the table. When it comes time to plan a large capital campaign, though, it’s time to focus on those constituents who can make or break such a significant undertaking: major donors. Look within your donor database. With these strategies on your side, you have nothing to worry about. So let’s get started! 1. Look within your donor database. Think about it in terms of finances. You can spend a lot of money on mass marketing to a wide pool of potential donors who might or might not return that investment with a donation. Or you can send significantly fewer, more targeted messages to donors you already support your mission. As such, the best place to start looking for major donors is within your own donor database. Wealth markers: Property ownership, job title, and zip code can all give you an idea of a individual donor’s ability to give a major gift. But wealth isn’t everything — just because someone is wealthy doesn’t mean they want to give significantly to a nonprofit. Be wary of relying too heavily on this one particular data point. Philanthropic indicators: Donors who have previously invested significantly in charity, political causes, and publicly traded stocks are more likely to give major gifts to nonprofits than donors who haven’t. Hobbies and interests: No two campaigns are the same, and sometimes it takes a specific cause to spark a major gift. The more you learn about your donors’ interests, the better chance you have of successfully targeting messages to them asking for a contribution to a campaign they would care about. Once you’ve examined your donor database for major donors, it’s time to look beyond the constituents who have supported your nonprofit in the past. You need a prospect list, either one you drew up yourself in-house or one you contracted from a prospect research firm. But looking beyond your current donors doesn’t mean you should leave them entirely out of mind. On the contrary, your existing donors are your best connection to prospective donors outside your organization. Put yourself in your prospect’s shoes. You’re a C-level employee at a large corporation. You’ve held seats on various nonprofit boards and regularly post articles about charitable causes on your social media profiles. You don’t have the time or inclination to respond to an email inbox full of generic solicitations from every nonprofit you’ve never heard of. But what if an old coworker called you to invite you to their favorite charity’s New Year’s gala? Wouldn’t you be much more likely to respond to someone you know? Donors who work for companies with corporate philanthropy programs can turn their contribution into a major gift through their employer. Executives can influence their company’s corporate philanthropy program, which includes sponsorships and in-kind donations. Business owners, especially small business owners, can always benefit from the positive publicity of a partnership with a charitable organization. Recently promoted employees will likely have more to give now than they did before. Modify your prospect template if you’re performing prospect research in-house, and specify what exactly you’re looking for if you’re outsourcing to a prospect research firm or fundraising consultant. The personal touch is everything with major donors. 8 No one will contribute a major gift without really feeling like that donation is not just necessary but appreciated and meaningful. Before you launch a capital campaign, get personal with your potential major donors by hosting an event. When nonprofits think of events, often they think of charity auctions or group volunteer events. That’s not what we’re talking about here. We mean events during which donations are not actively collected. The beginning of a capital campaign is a great time to hold more personal events that give you facetime with your donors because there’s nothing more powerful than an in-person solicitation. You don’t even have to have publicly launched your campaign yet to host one of these events. 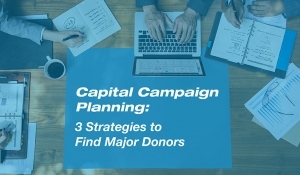 Many nonprofits use the quiet or planning phase of their capital campaigns to connect with major donors and major gift prospects. Always include a “plus one” in your invitation. You never know who could show up that wasn’t on your prospect list will end up contributing a major gift because of what they saw or heard. An important element of any kind of nonprofit event is the follow-up. Always send a note thanking your donors and prospects for attending, mentioning specific conversations you had or people you introduced them to. Soliciting major gifts for a capital campaign isn’t an exact science. You will almost always have some of your asks declined, and some of your donors might surprise you with the gifts they’re willing to contribute. Though you can’t force anyone to donate a certain amount, you can use the strategies at your disposal to show your major gift prospects how great a fit they are for your organization. Capstone Advancement Partners: Is Loyalty More Important than Capacity?